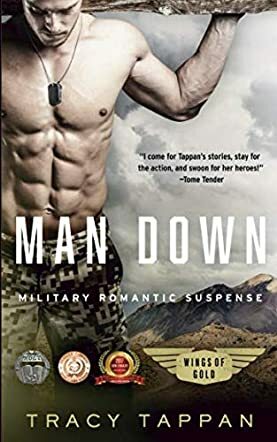 Man Down: Wings of Gold Book 3 by Tracy Tappan is one of the coolest romances I have read so far this year. The story follows a soldier and a doctor who travel through a dangerous land towards safety, and in the meantime, the two of them find love. The story follows Petty Officer Shane “Mad Dog” Madden and Lieutenant Commander Jason “Casanova” Vanderby are the sole survivors of a helicopter crash in Northern Pakistan. Together, these two soldiers find a help station where they meet the beautiful and charming Dr. Farrin Barr. She is the head doctor at the help station and the only one remaining behind. If Jason and Shane thought this would be the end of their journey, they thought wrong. Now, these two men and Farrin are on the run from terrorists and trying to stay alive. Through this journey, Farrin and Jason feel a strong attraction between them, but this is not the time for romance. Fighting for their survival, they realize that even though they are ready for each other, their pasts and their present are not letting them explore their desires and what their relationship could be. Can Jason and Farrin let go of the past? Will they even get the chance to explore their feelings when the enemy is so close behind them? What can I say about this novel? I loved the dynamics between Jason and Shane. These two childhood friends had each other’s backs at all times. I loved Farrin, she is smart, strong and not a shrinking wallflower like most of the female characters in similar novels. She gives as good as she gets and she is not afraid to show everyone that she is ready to claw her way out if she has to. The story was intense, the characters were given proper time to develop and heal, and I loved the fact that nothing was rushed, even though it was certainly not a slow paced novel. Even the cover of the novel is awesome!